Newslinks this week focuses on two recent obituaries, one a noted NFL football player and another a noted construction executive. Their passing should be of interest by the ready mixed concrete industry because they both had the word "concrete" attached to their names, Chuck Bednarik of the Philadelphia Eagles and A. James Clark of Clark Enterprises. 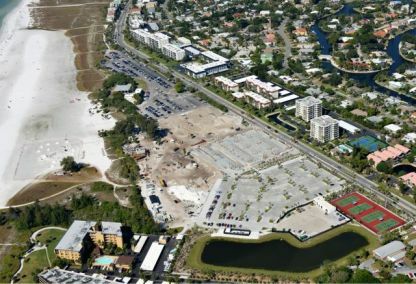 NRMCA Producer member Preferred Materials recently supplied pervious concrete for a new 27.3 acre parking lot for Sarasota County in Siesta Key Beach, FL, reports NRMCA Vice President, National Resource, Amy Miller. Being named the #1 beach in the United States by "Dr. Beach," the new pervious parking lot (shown below) was constructed to maximize usage of land and eliminate detention area. The job consisted of placement of over 6,000 yards of pervious in two phases over an 8-month time frame, Miller said. The project was designed by Kimley-horn and constructed by NRMCA certified pervious contractor Curb Systems of Southwest Florida. "Sarasota county has a great parking area and the natural water detention in the pervious to control stormwater runoff. Sarasota county considers this project a major success and is moving forward with more pervious in different areas of the county," stated Ross Allen, quality control manager of Preferred Materials. NRMCA Senior Director, National Resources, Phil Kresge recently spoke at the Concrete Technical Conference hosted by the New York Construction Materials Association / New York Concrete Promotion Council. Kresge’s presentation titled Roller-Compacted Concrete from Ready Mix Concrete Producers was well received; he reported that there is great interest from several of the attendees, including representatives from New York State Department of Transportation (NYSDOT). While in the metro New York area, Kresge also met with representatives from the New York City design firm of Ohlhausen Dubois Architects. The lunch and learn presentation focused on design and specifications of pervious concrete, as well as emphasis on maintenance and use. The new NRMCA Pervious Concrete Pavement Maintenance and Operations Guide was provided to all attendees. If you are in sales, then you have probably had a story similar to this; You make that one last sales call or phone call, attend that "optional" industry or community meeting, only to have the person or contact say to you, "I’m glad you called" or "What a coincidence, we were just discussing this issue, so we are glad you are here". This happens every day to sales people across the country in every industry. NRMCA Senior Director, National Resources, Doug O’Neill reports of a recent experience of being in the right place at the right time. "In so many of NRMCA’s training sessions, whether it’s a Webinar or in-person seminar, the topic of getting involved, participating in your community, in your marketplace, in your industry, is an ongoing theme," O’Neill said. "We talk about attending town Planning Board meetings and getting involved in local chapters of the USGBC, (US Green Building Council), APWA (American Public Works Association), and the American Concrete Institute (ACI)." Recently, O’Neill was in the Buffalo area to meet with a member and partner and was invited to attend a Western New York Chapter of an ACI meet and greet; a last minute decision since this event was taking place that evening. During the event, which was well attended by personnel from ready mix, cement and members of the engineering community, he was introduced to a representative of a local municipality with whom the industry had been trying to discuss the municipality's local streets and roads program. Due to the heavier than normal snow fall this winter, this town had been consumed with snow removal and keeping the streets clear, thus the lack of response to his repeated requests for a meeting. This informal setting provided the opportunity to bend this person’s ear on what the concrete industry has to offer municipalities regarding the design and construction of concrete streets. The lines of communication just opened up, simply because we were in the right place at the right time. For suggestions on how your company can get more involved in community and industry events, contact Doug O’Neill at doneill@nrmca.org. NRMCA Paving Engineer Amanda Hult and Senior Director, National Resources, Phil Kresge will host a free, one-hour Design Assistance Program (DAP) Webinar on Tuesday, March 31, at 11:30 a.m. Eastern time. The Webinar will detail the free services provided to the industry through the Design Assistance Programs. NRMCA staff will discuss in detail the information provided in the deliverables as well as how to use this information as a part of the promotional effort for parking lots and streets and local roads. This Webinar is ideal for those involved in the promotion of concrete pavements or looking for assistance in gaining market share in concrete parking lots and streets and local roads. Designers and specifiers looking for information on how to submit for pavement design assistance are also invited to attend. The survey is filled out by industry fleet managers and/or financial managers early each year, based on data gathered from the previous calendar year’s performance. This year’s form includes new question on mixer drum composition, idle time, and types of fuel being used. The Fleet Benchmarking Survey is used to establish industry benchmarking norms and procedures. Information gathered from the annual Fleet Benchmarking Survey is published in a full report in Concrete InFocus magazine each autumn. A shorter Executive Summary of the survey is also made available to all. The deadline for submitting completed entries by e-mail to gmullings@nrmca.org is Wednesday, April 1. Click here to access an entry form. For more information, contact Gary Mullings at gmullings@nrmca.org. NRMCA's Safety Contest & Benchmarking Survey has for years been a safety performance and incentive/award program aimed to foster safe practices at ready mixed concrete plants across the nation. The survey is a per-plant contest open to all facilities operated by NRMCA member companies in good standing in 2014. Companies with more than one division are encouraged to distribute entry blanks to individuals responsible for keeping safety records at each plant location. Entry forms must be received by Karen Bean at kbean@nrmca.org by Wednesday, April 15. Click here for more information, a link for the survey form and staff contact. Media articles on Congress, transportation infrastructure, regulation, taxes and other subjects, each of which relate to the ready mixed concrete industry, are updated each week by NRMCA's Government Affairs staff. To access the most recent compilation of articles for March 16 - 20, 2015, please click here. If you would like to receive this weekly updated link in a separate e-mail, or if you have questions or comments about the roundup, contact NRMCA’s Kerri Leininger at kleininger@nrmca.org. On March 19, the House of Representatives adopted the Congressional Review Act (CRA) Resolution, by a voice vote of 232-186, to block the National Labor Relations Board (NLRB) from implementing the "ambush election" rule. The CRA was introduced by House Education & Workforce Committee Chairman John Kline (R-MN) along with House Health, Employment, Labor and Pensions Subcommittee Chairman Phil Poe (R-TN) and mirrors the Senate measure that passed earlier this month (53-46) offered by Senate Majority Leader Mitch McConnell (R-KY) and senators Lamar Alexander (R-TN) and Mike Enzi (R-WY). The CRA will now head to the President’s desk where he is expected to issue a veto. The "ambush election" rule, finalized by the NLRB in December 2014, becomes effective on April 14, 2015 and implements sweeping changes to union elections. It allows a labor union to hold an election in as few as 11 days – the current election is held in an average of 38 days -- after the Board receives an election petition, prevents workers from receiving balanced information from both sides of the bargaining table and requires employers to disclose their employees’ personal contact information. NRMCA, along with members of the Coalition of Democratic Workforce (CDW), sent a letter to members of Congress supporting the Congressional Review Act in order to stop the NLRB from implementing this rule and educated members of Congress and their staff on the negative impacts of this rule on the ready mixed concrete industry. In addition, the CDW previously filed a federal lawsuit to block the ambush-election rule. NRMCA supports the lawsuit. Due to the increased demand, the NRMCA March Internet Spotlight, good through Tuesday, April 8, is the ASTM Standards for Concrete Technician Certification Guide. This publication includes 12 ASTM practices and test methods related to testing fresh and hardened concrete, including those required for ACI grade 1 field-testing and strength testing technician certification. Purchase of this guide is for NRMCA members only. Order online today and receive 15% off the already low NRMCA member price and ASTM prices. Regular member price is $42, Internet Special $38.70, plus shipping. Use Discount Code: ISMAR15.